This post compares medical applications, interactions, side effects and therapeutic effects of naproxen sodium and ibuprofen in general and in treatment of back pain, toothache, cramps and inflammation. This is a long read but worth your time if you want to get more information about these two drugs. While we tried to provide as accurate information as possible never take any medicine without prior consent of your physician and always seek proper medical attention when you do not feel well. Self medication at home is a common practice now because nobody would want to go to the doctor for minor ailments. Same is the case with the use of pain killers and antipyretic drugs because we all have these emergency drugs available at home, all the times, which we take without any hesitation when it comes to self-treatment of headache or fever. Self medication seems to be a convenient way to tackle minor ailments like fever, headache or toothache, but it can do more harm than good if you keep on using these over the counter drugs without having a proper awareness about their use. This way you may end up having over dosage of the medicine that can have serious consequences if overlooked. Over dosage of pain killer drugs was just one aspect of self medication, but sometimes we do even bigger mistakes. How can you be so sure that the pain killer you are taking for headache is actually meant for it? Sometimes, we take wrong type of pain killer for the wrong type of pain. It might be possible that the pain killer or anti inflammatory drug you are using for headache is actually more effective at relieving muscle pain rather than headache. To put it in simple words, a number of anti-inflammatory drugs are available that tend to relieve pain, fever and inflammation. Some of them are effective against pain and inflammation while others have the tendency to relieve fever. The purpose of this article is to compare two anti-inflammatory drugs; naproxen sodium and ibuprofen. Both are anti inflammatory drugs, but they are distinct from each other on the basis of their uses, dosage and side effects. 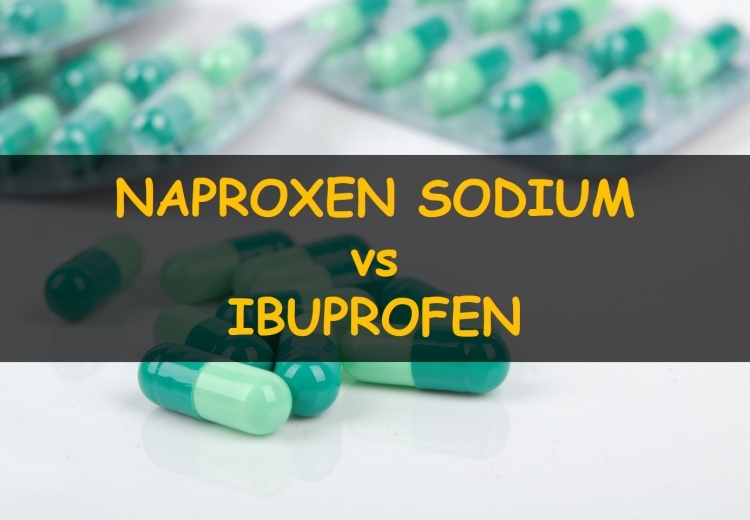 This detailed comparison of two drugs will tell you when to use naproxen and when to use ibuprofen at the right time for the right indication. A little know how of these two drugs and their major differences can help you use them at the right time for the right purpose. This way you get the maximum benefits of these drugs with minimal side effects. So read on to know how these two drugs are similar yet different at the same time! Naproxen sodium is the sodium salt of naproxen having better bioavailability (the amount of drug that actually enters into your system) and longer duration of action. Naproxen belongs to a class of drugs called non steroidal anti inflammatorydrugs (NSAIDs). Naproxen helps reduce inflammation by blocking the production of inflammation causing hormones. Naproxen sodium is widely used for treating pain, fever, stiffness and swelling. The IUPAC name of naproxen sodium is sodium;(2S)-2-(6-methoxynaphthalen-2-yl)propanoate. The recommended use of naproxen sodium is meant for pain and swelling associated with inflammatory joint diseases like arthritis, ankylosing spodylitis, acute gout, tendinitis and bursitis. However, its use apart from these conditions, like mild pain and fever, should be done cautiously because a lot of other antipyretics and pain killers, with better efficacy and fewer side effects are available that can be used to relieve fever and mild pain. For inflammatory joint conditions like rheumatoid arthritis, osteoarthritis and ankylosing spondylitis, the recommended dose of naproxen sodium to start with is 275mg to 550mg, twice a day. However, dosage adjustment can be made according to individual’s need and response to the drug. But, the total daily dose of naproxen sodium must not exceed 1500mg. For acute tendinitis and bursitis, the initial dose to start with is 550mg. Later on, 550mg every 12 hourly or 275mg every 6-8 hourly can be taken depending on the need of the individual. Again, the total dose of this drug must exceed 1500 mg in one day. For attacks of acute gout, the recommended dose of naproxen sodium is 825mg initially. Then it can be followed by 275mg every 6-8 hourly until the attack subsides. However, the maximum dose of naproxen sodium must not exceed the safe limit of 1000mg per day. For treating menstrual cramps, the recommended dose of naproxen sodium is 550mg initially, then followed by either 550mg every 12 hours or 275mg every 6-8 hours. For pains and aches in adult, the recommended dose is 550mg initially, and then followed up by 275 mg every 6-8 hourly. For juvenile rheumatoid arthritis in children under the age of 2 years, the recommended dose of naproxen sodium is 10mg/kg, divided into two doses. However, careful dose monitoring should be done to avoid the risk of drug over dosage and the maximum dosage must not exceed 1000mg per day. Any higher dosage than this safe limit can bring serious harm to the child. For pain or fever relief in children above the age of 12 years, the recommended dose is 550mg initially, followed by 275mg every 6-8 hours. But, the total dose must not exceed 1300 mg per day. Naproxen sodium is not recommended for use in children under 12 years of age but, if it has to be given in children under 12 years of age due to some medical reason, then make sure to calculate the correct dose. The recommended dose of naproxen sodium for fever and pain relief in children between 2-12 years of age is 5-10mg/kg every 8-12 hours. However, the maximum dose of naproxen sodium must not exceed the safe limit of 1000mg per day. Like all other NSAIDs, naproxen sodium should not be taken in more than the recommended amount because doing so may bring you more side effects than goods. Do not try to chew or crush the naproxen tablets. Swallow them as a whole with a large glass of water. If you have a history of allergy to aspirin or any other NSAIDs, then do not take this medicine because chances of cross sensitivity are high in such conditions. Naproxen sodium tends to irritate the stomach lining and can cause gastritis and ulcers, so their prolonged use without doctor’s recommendation should be avoided. Similarly, those who already have stomach problems must consult doctor before taking naproxen sodium. It’s better to take naproxen sodium along with food or milk to minimize the stomach irritation. That’s a useful tip for those who are having gastrointestinal problems and are recommended this medicine by their doctor. Naproxen sodium is the drug of choice for use in children under 12 years of age. But, if it has to be given then careful dose monitoring should be done. Like all other NSAIDs except aspirin, naproxen sodium tends to increase the risks of stroke and heart diseases. Therefore, if you are having heart disease or high blood pressure, avoid taking naproxen sodium for long term use without telling the doctor first. Naproxen sodium should not be used for the management of pain before and after coronary artery bypass surgery. Those having history of asthma should take naproxen sodium cautiously as it can exacerbate their condition. Avoid taking alcohol while taking naproxen sodium as it can potentiate the stomach irritating effect of naproxen sodium. In patients having kidney and liver diseases, dose adjustment needs to be done because excretion of drug becomes slow in these patients, thus potentiating the risk of serious side effects. Pregnant and lactating ladies should not take naproxen sodium without asking the doctor first. This drug can harm their babies too. Antipyretic effect (by reducing fever). Whenever an inflammation occurs in any part of body, there is the production of inflammation causing chemicals, named as prostaglandins, at that site. There are two enzymes known as COX-1 and COX-2 that are responsible for the synthesis of these prostaglandins. Prostaglandins act on the blood vessels at the site of inflammation and make them leaky, resulting in pain and swelling. Naproxen sodium helps reduce inflammation by inhibiting these enzymes, thus blocking the synthesis of prostaglandins. Once the synthesis of prostaglandins is slowed down, the signs of inflammation begin to settle down on their own. But, not all prostaglandins are inflammation causing, some of the prostaglandins are required for normal functioning of body. Examples of such prostaglandins include the ones produced in stomach and kidneys. In stomach, the prostaglandins cover the stomach lining and protect it from the action of stomach acids. But, all anti inflammatory drugs also block the synthesis of these protective prostaglandins. So, in stomach, the reduced synthesis of prostaglandins results in irritation of stomach lining, bleeding and ulcer. On the other hand, in kidneys, the prostaglandins are involved in blood pressure regulation, thus their reduced synthesis leads to water retention and peripheral edema in the body. However, these effects of naproxen sodium are likely to occur only with the long term use. Prostaglandins cause the sensitization of nerve endings at the site of inflammation or pain mediators such as bradykinins and histamine. This sensitization of pain nerve fiber leads to enhanced pain conduction, thus potentiating the pain intensity. Naproxen sodium exerts its analgesic effects by reducing the prostaglandin synthesis. The lower the prostaglandin synthesis, the lesser will be the nerve sensitization to pain. Thus, reducing the nerve sensitization leads to pain relief. Temperature regulation of the body is done through hypothalamus in the brain, also known as natural thermostat of the body. When the set point of this thermostat is elevated, it results in fever. Prostaglandins tend to cause fever by elevating this set point of thermostat. Naproxen sodium, by inhibiting the synthesis of prostaglandins, lowers down the set point of thermostat and relieves fever. After oral intake, naproxen sodium is readily absorbed through the GI tract with the bioavailability of about 95%. Plasma concentration begins to rise within 30 minutes and peak plasma concentration is achieved within 1-2 hours. However, the peak plasma concentration is attained within 2-4 hours when extended release tablets are use. Food intake has no significant effect on its absorption. Therefore, food or milk can be taken along with this drug to suppress its GI side effects. After absorption, the drug binds to plasma proteins and is distributed throughout the body tissues, especially to the site of inflammation. Plasma protein binding percentage of naproxen sodium is about 99%. Naproxen sodium is extensively metabolized in the liver and is converted into glucuronide conjugated metabolites. About 95% conjugated products of naproxen sodium are excreted through urine. Plasma half life of naproxen sodium is about 15 hours. Blood thinning drugs like aspirin, warfarin and anticoagulants tend to have significant drug interaction with naproxen sodium. The likelihood of stomach bleeding and skin bleeding is increased when both these drugs are taken together. Some antacids, when taken along with naproxen sodium, may reduce its effectiveness. Therefore, avoid concomitant use. Naproxen sodium should not be taken with lithium because the chances of lithium toxicity get many folds higher with naproxen sodium. Taking any other NSAIDs along with naproxen sodium increases the risk of side effects, especially GI bleeding and stomach upset. This combination should be certainly avoided. Naproxen sodium has strong drug interactions with blood pressure medicines and diuretics. Always talk to your doctor about the drugs you’re using. Ibuprofen is another anti-inflammatory drug, belonging to the non steroidal anti inflammatory group of drugs. Ibuprofen is considered to be the choice of drug for fever and mild to moderate pain relief in adults as well as children. However, it can also be used as treatment option for inflammatory joint conditions. The IUPAC name for ibuprofen is (RS)-2-(4-(2-methylpropyl)phenyl)propanoic acid. For fever in adults, the recommended dose of ibuprofen is 400mg initially, followed by 400mg or 200mg every 4-6 hours. However, the maximum dose of ibuprofen must not exceed the safe limit of 1000mg per day. For mild to moderate pain in adults, the recommended initial dose is 400mg, later on followed by 400mg or 200mg every 4-6 hours as needed. For menstrual pain or dysmennorhea, the recommended is 400mg 0r 200mg every 4-6 hours depending on the individual’s need. For osteoarthritis, the recommended dose is 400mg or 800mg every 6-8 hours. However, the maximum dose of naproxen sodium must not exceed the safe limit of 1000mg per day. For rheumatoid arthritis, the recommended dose is 400mg or 800mg every 6-8 hours as per need. For juvenile rheumatoid arthritis, the recommended dose is 30-40mg/kg, divided into 3-4 doses. For patent ductus arteriosus, the recommended intravenous dose is 10mg/kg followed by two doses of 5mg/kg in next two days. Do not give ibuprofen to children under 6 months of age without asking the doctor. Do not try to give tablets to young children as they can cause choking. While using infant drops or liquid suspensions, measure the correct dose according to child’s weight. Use syringes or droppers provided with the liquid medicines to measure exact dose. Too small or too much dosage may produce less or more than desired effects. Read the label and instructions carefully before giving it to the children. Dose can be repeated every 4-6 hours in adult and 6-8 hours in children, but number of doses must not exceed 4 doses in a 24 hour period. Ibuprofen significantly increases the risk of stroke, heart diseases and congestive heart failure when used in higher doses for prolonged time. Therefore, people having heart diseases or blood pressure should not take ibuprofen for the term use without doctor’s consultation. Ibuprofen causes aggravation of asthma so it should be avoided by asthma patients. Patients having any bleeding disorder must consult doctor before taking ibuprofen as it can cause further thinning of blood. Risk of GI bleeding or stomach upset are less with ibuprofen use but still, the long term use or over dosage of ibuprofen can cause stomach irritation, bleeding or ulcer. If there is history of allergy to any other NSAIDs, do not take ibuprofen as it can stimulate allergic reactions. Pregnant and lactating women need to consult doctor before taking ibuprofen. Since ibuprofen belongs to NSAIDs group of drug, its mechanism is similar to them with three therapeutic effects; anti inflammatory effects, analgesic effects and antipyretic effects. COX-1 and COX-2 are the factories of prostaglandin synthesis. These prostaglandins are the main culprits behind pain, fever and inflammation because they attract the inflammatory mediators to the site of inflammation. Ibuprofen shuts down this factory and reduces prostaglandin synthesis. As the level of prostaglandins fall, the migration of inflammatory mediators towards the site of inflammation reduces which helps lessen the inflammation. Apart from this, diminished prostaglandin release inhibits the nerve sensitization and lowers the set point of hypothalamus, thus providing pain and fever relief. After oral intake, ibuprofen is rapidly absorbed through the GI tract. Bioavailability of ibuprofen is about 80% and the peak plasma concentration reaches within 1.5-2 hours. Food intake does not interfere with the absorption of drug. Therefore, food can be taken along with medicine to provide protection against irritation caused by it. After absorption, it binds to plasma proteins and is distributed throughout the body tissues. Plasma protein binding percentage of ibuprofen is about 99%. Extensive metabolism of ibuprofen takes place in the liver with the help of hepatic enzymes. After metabolism, ibuprofen is converted to conjugated glucuronide metabolites. About 90 percent of drug is excreted through kidneys and urine in the form of conjugated metabolites. Only 10 percent drug appears unchanged in the urine. The plasma half life of drug is about 2 hours. Complete excretion of drug occurs within 24 hours. If any of the above mentioned symptoms appear after taking ibuprofen, immediately seek for medical help. When ibuprofen is taken along with other NSAIDs like aspirin, chances of GI bleeding or skin bruising are increased. Use of ibuprofen along with antidepressants should be avoided as they increase likelihood of GI bleeding is increased. Ibuprofen increases the risk of lithium toxicity as it delays the lithium excretion. Ibuprofen also delays the excretion of methotrexate. Therefore, when they are used together the risk of methotrexate are enhanced many folds. Never take ibuprofen with any blood thing or blood pressure drugs as they cause significant drug interactions. Both naproxen sodium and ibuprofen are the recommended drugs for back pain, but both have their own pros and cons. Ibuprofen provides fast relief from pain while naproxen is more effective for long term pain relief. If you are having mild to moderate back pain, then start with ibuprofen first as it has fewer GI side effects. But, if the pain is not relieved despite taking ibuprofen, consider taking naproxen sodium as will reduce the muscle inflammation and provide prolonged relief from pain. Since toothache is minor ailment with the localized inflammation, the choice of drug for toothache will be ibuprofen. Ibuprofen is safer as compared to naproxen in term of GI side effects so it is considered to be choice of drug for ibuprofen (9). But for some people, ibuprofen does not help to reduce pain because ibuprofen does not relieve inflammation as effectively as ibuprofen. So, if the toothache does not relieve on taking ibuprofen, take naproxen sodium in low doses as it will provide effective pain relief. Ibuprofen is considered to be the best choice for relieving minor tension headaches as it provides fast pain relief as compared to ibuprofen. However, for migraines that does not relieve on taking ibuprofen, naproxen sodium can be taken. When it comes to treat inflammatory conditions like arthritis or ankylosing spondylitis, nothing can beat naproxen sodium as it highly effective at relieving inflammation. Naproxen sodium is actually meant for treating inflammatory joint conditions and muscle pains. Since its stays longer in the body, it provides long term effective relief from inflammation and pain in the inflammatory diseases (10). Again both drugs are prescribed for treating cramps that can either be muscle cramps or menstrual cramps. But, the choice of drug depends upon intensity of pain or individual’s response to drug. For mild pain, ibuprofen will work fine because it provides quick relief from pain. However, for resistant pain or severe pain that keeps on returning despite taking ibuprofen will require more strong anti inflammatory drug like naproxen sodium. Studies have proved that naproxen sodium is more effective than ibuprofen for treating severe menstrual cramp pain. Both naproxen sodium and ibuprofen have the same mechanism of action and effects. However, they still have some differences that distinguish them from each other. Both drugs have their own pros and cons. Ibuprofen, as compared to naproxen sodium, produces less GI side effects like stomach upset or irritation. But, the chances of stroke and heart disease are high with ibuprofen use. That is why ibuprofen is used for treating just mild to moderate pain because it provides rapid relief. However, its prolonged use is avoided due cardiovascular risks. On other hand, naproxen sodium has got superiority on ibuprofen in terms of its analgesic and anti-inflammatory effects as it provides long term relief. Therefore, naproxen sodium is considered to the choice of drug for inflammatory joint diseases. See numbered references within the article.